Muhamad Nasir Habizar was fed up. Parking had become such a hassle. When parking meters were in use, you could never find one that was working. And the subsequent scratch-and-display system was nothing if not inconvenient and cumbersome. Unlike most consumers, however, Muhamad Nasir did not just sit around and whinge; he actively worked to come up with a solution. In 2008, the future CEO of JomParking (who is also the CEO of AppCable Sdn Bhd) was invited to participate in an open tender to provide a smart parking solution for Terminal Bersepadu Selatan (TBS), the main bus terminal for long-distance trips in Kuala Lumpur. TBS did not end up working with JomParking. But in the process, Muhamad Nasir (and five part-timers) started to develop their own parking solution. It took them four years to come up with an SMS-based parking system. However, the solution was still not feasible in 2012. “The problem was that the SMS and USSD (Unstructured Supplementary Service Data) services were telco-dependent, which required us to connect with all the telcos in Malaysia, making it difficult and costly,” says Muhamad Nasir. Eventually, they decided to turn their solution into a mobile app, which cost them about RM500,000. At this point, the team realised that although they had been working on it for years, they did not really know much about parking systems. “Since we are predominantly app developers, we needed to gain an understanding of the parking systems in the country. So, we took the time to gather knowledge and experience from consumers, local councils and parking operators,” says Muhamad Nasir. After much trial and error, they successfully carried out the pilot testing for JomParking in July 2015. This is the service the company offers today. The app started to gain the public’s attention, with the help of the media, when JomParking participated in various programmes in 2017. They included Cradle’s Coach & Grow Programme, the Malaysian Global Innovation & Creativity Centre’s (MaGIC) Global Accelerator Programme and Cyberview’s Living Lab Accelerator Programme. 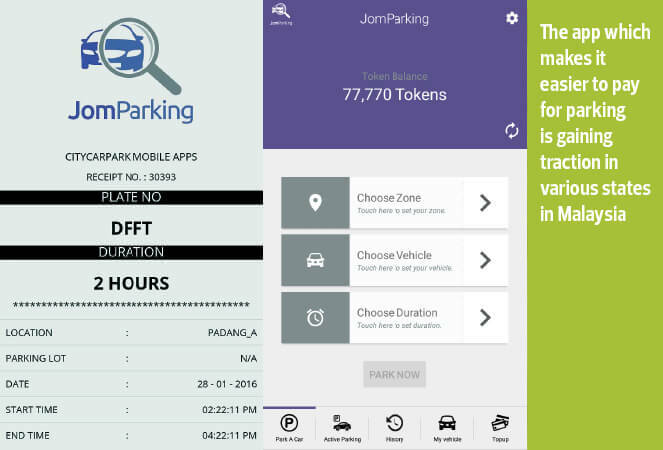 JomParking’s easy-to-use app allows consumers to pay for their parking using their smartphones. All they need to do is input their vehicle number to pay for their parking. Users need to purchase in-app tokens to pay for parking. RM1 is equivalent to 100 tokens and the minimum top-up value is RM5. The app started to gain traction and the team set up JomParkir Sdn Bhd to focus specifically on the service. The company is a subsidiary of Muhamad Nasir’s other company, AppCable, which provided most of the funding for JomParking. Muhamad Nasir and his crew were determined to sign up as many local councils as possible. “We travelled from Perlis down to Johor and also to Sabah and Sarawak to introduce this solution to local councils. The biggest challenge we faced was acceptance,” he says. Basically, it takes two to three years for a local council to pick up a new idea. In fact, it took two years to get Kuala Lumpur City Hall (DBKL) on board. That is because most local councils are stuck in their comfort zones with their existing parking systems. Also, most of them do not have enough confidence in the app, especially since it is being run by a start-up. Another hurdle is the tedious process that local councils have to go through to ensure that the use of JomParking does not contravene their regulations. “[Local councils] have to change a lot of things, including their by-laws because most of the by-laws state that you need to display the ticket or coupon on your dashboard. With the app, there is nothing to display. So, they have to change the by-laws and that takes a long time because it involves the state government,” Muhamad Nasir explains. Over time, more local councils became aware of mobile parking solutions and several of them were proactive in amending their by-laws even before they were approached by JomParking. These councils were receptive because they basically saw that the parking solution would lower their costs. In addition, it is paperless and, thus, environmentally friendly. Last year, JomParking targeted a revenue of RM7.5 million, but the change in government put paid to its projections because it needed to come up with new proposals to satisfy the new administration. Muhamad Nasir says one of the main criticisms against JomParking is that it does not offer services in enough areas. But as he points out, getting local councils on board is time-consuming and JomParkir still does not have a large team. The company currently has a team of 20, which it is looking to increase to 25. But talent acquisition is a challenge. “Since we have a small team with a lot of things to do, we take a long time to implement new features or introduce new services,” says the CEO. JomParking is currently available in areas that fall under the jurisdiction of DBKL, Tawau Municipal Council (Sabah), Iskandar Puteri City Council (Johor), Kota Baru Municipal Council (Kelantan), Seremban Municipal Council (Negeri Sembilan) and Cybersquare (Selangor). The app is also available in some buildings such as TBS, TSI Sports Arena (Selangor) and the PWTC LRT station. JomParkir is looking to add three more local councils to its list by the first quarter of 2019. As for buildings or off-street parking, it is in talks with a few shopping mall owners and hopes to add five sites. The company has launched two new products — JomForce and JomValet. The former is meant for enforcement officers who need to check whether vehicle owners have paid for parking, by entering the car’s number plate into the app. Muhamad Nasir believes the app will help local councils gather data and improve their services in high-traffic areas as well as carry out enforcement measures more effectively. JomValet, as the name suggests, is for valet operators to manage vehicles and record transactions digitally, without the need for paper receipts. With all its apps, the company has been collecting a great deal of data which other companies can use to tailor deals for consumers. So, it will be introducing a new feature, JomData, to customise deals and advertisements for consumers based on their parking patterns. “We plan to collaborate with various businesses to offer a service where we analyse data from consumers to offer targeted content. This will be a win-win for consumers and advertisers because we are planning to extend this across the country,” says Muhamad Nasir, adding that this is targeted for launch by the second quarter of this year. He is hoping to expand into Indonesia by the end of this year. The company is also planning to raise between RM5 million and RM7 million at its Series A round of funding that will be closed in June. The money will be used to fund the expansion. However, Muhamad Nasir is not in a hurry as JomParkir is determined to find the right local partner before entering that or any other market. He feels that Indonesia, with a population of more than 260 million and similar culture and language, is an ideal second market.